What does postcoloniality have to do with sacramentality? 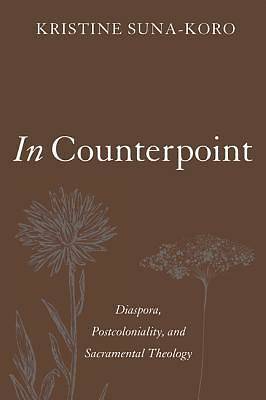 How do diasporic lives and imaginaries shape the course of postcolonial sacramental theology? Neither postcolonial theorists nor sacramental theologians have hitherto sought to engage in a sustained dialogue with one another. In this trailblazing volume, Kristine Suna-Koro brings postcolonialism, diaspora discourse, and Christian sacramental theology into a mutually critical and constructive transdisciplinary conversation. Dialoguing with thinkers as diverse as Edward Said and Gayatri Spivak as well as Francis D'Sa, S.J., Martin Luther, Mayra Rivera, and John Chryssavgis, the author offers a postcolonial retrieval of sacramentality through a robust theological engagement with the postcolonial notions of hybridity, contrapuntality, planetarity, and Third Space. While exploring the methodological potential of diasporic imaginary in theology, this innovative book advances the notion of sacramental pluriverse and of Christ as its paradigmatic crescendo within the sacramental economy of creation and redemptive transformation. In the context of ecological degradation, In Counterpoint argues that it is vital for the postcolonial sacramental renewal to be rooted in ethics as a uniquely postcolonial fundamental theology. ""Kristine Suna-Koro does phenomenal work reading the sacraments through postcolonial lenses. Keeping a complex language, she gives us one of the best gifts a theologian can offer: the work of the imagination Grounded in expansive postcolonial theory and solid sacramental theology, Suna-Koro shows how the theological imagination, when done from a diasporic place, can challenge and expand the ways we think about​ God. Echoing Aidan Kavanagh, by way of the Baltic Sea, Suna-Koro issues a call for us to consider sacramental theology as theologia prima."" --Claudio Carvalhaes, Associate Professor of Worship, Union Theological Seminary, New York City Kristine Suna-Koro is Associate Professor of Theology at Xavier University in Cincinnati, Ohio. She is a Latvian-American diasporic theologian working at the intersection of postcolonialism, liturgical and sacramental studies as well as migration and diaspora discourses. As a Lutheran pastor she has served the diasporic Latvian Lutheran communities in Great Britain, Germany, and the United States.